In order to increase finished product value, improve the production process and optimise energy use, Aquatech has designed Easycool+, a new range of Ecodesign 2021-ready chillers. May, 28, 2018 - Plastics conversion processes are now consolidated, so how can one achieve an even better product while still minimising overall costs ? Aquatech says its new Easycool+, a new range of Ecodesign 2021-ready chillers, increases finished product value while improving the production process and optimising energy use. If they are inefficient, their initial costs are lower but they have to be run at full capacity: expensive maintenance and imprecise temperature control negatively impact finished product quality and costs. According to Aquatech, its Easycool+ overcomes this problem because it is a chiller conceived, designed and built for cooling in industrial processing of plastics. It presents flexibility, energy efficiency, reduced footprint and low environmental impact, Aquatech claims. The company says that Easycool+ has been designed in line with the energy efficiency targets set for 2021 - Ecodesign Regulation 2281/2016 - for a range of equipment including both air- and water-cooled chillers. This directive enforces compliance with seasonal efficiency parameters, the SEPR (Seasonal Energy Performance Ratio). The optimum temperature ensures the best product quality. When processing plastics, the temperature ranges to be maintained for different processes can vary significantly, even by as much as fifty or more degrees, demanding different pressures and flow rates from the chiller: According to Aquatech, Easycool+ has the flexibility to maintain optimal working conditions at all times. Power range from 60 to 250 kW, for maximum flexibility of use. Shell and tube, for situations where treated water is not available. According to Aquatech, the steel beam frame ensures strength and safety, even during transport or handling in difficult conditions, where there is often a high risk of damage to the machinery. Quality internal components ensure quality and long-life. Easycool+ has reduced maintenance costs. All components are arranged inside the unit for easy access by the maintenance technician with maximum convenience. The refrigerant circuit is designed for periodic testing in accordance with current European legislation. The state-of-the-art control software allows operating parameter monitoring and troubleshooting, even remote. The software can also be connected to Piovan’s Winfactory 4.0 supervision software. The new chiller range was launched at Plast 2018. 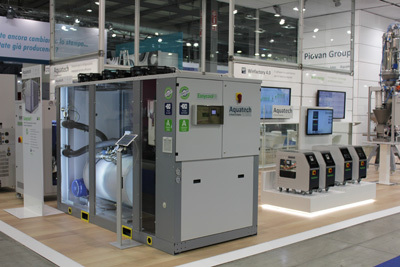 Aquatech is the Piovan company that designs and builds cooling systems for industrial production where performance, optimisation, and energy efficiency define the quality of the product. The company opened its doors in January 2015 and represents the natural evolution of Piovan’s existing chiller division that has designed, produced and supplied chiller solutions to the industry for the latest 40 years. Aquatech product range includes: air and water cooled chillers, thermochillers, mould temperature controllers, drycoolers, pump stations, integrated solutions. Piovan, headquartered in Santa Maria di Sala, Venice, was founded in 1934 as a mechanical engineering company; in 1964 enters the plastics industry, specialising in material handling technologies and, subsequently, in mould temperature control and industrial cooling. Nowadays, with 7 production facilities located in Italy, Germany, Brazil, China and USA, 26 subsidiaries, representatives for more than 65 countries and a workforce of 998, the group has consolidated its position in global industry of ancillary equipment, engineered solutions and services.